A frequently overlooked part of your life, your garage door, is more significant than you think. Garage doors are a surprisingly heavy feature of a home, and they need consistent upkeep to remain a secure entry point and an instrument of ease. The system that makes these rolling doors so simple to lift suspends hundreds of pounds so you can access your garage for tools, storage or to park your vehicle. Just like your car, continual maintenance is not optional for garage doors if you want them to last and remain a useful feature of your home. Annual garage door checkups will inform and prepare you for any necessary repairs or possible upgrades to keep your home in prime shape. Follow these garage door maintenance tips to understand how to supplement professional maintenance and participate in the upkeep of your space. Garage door maintenance is a crucial process. As a shield between your belongings and the elements, your garage door is a vital feature of your home. However, you need to check its status to ensure it remains in good condition. What exactly does maintenance of garage doors help you with, and why is it important? These purposes are why you periodically check up on your garage door’s condition. If you prepare for degrading parts and structure, you’ll catch them early. Rust, erosion and other natural occurrences are some of the ways your garage door can falter over the years. Inspect your garage door often, so these gradual processes don’t disrupt your life. Natural causes compromise your garage door as a solid barrier between your car or storage and the outside world. Ground erosion progresses over the years, forming an opening at the bottom of your garage space. The specifications that made the door solidly reach the ground when it was installed will have changed if erosion has worn away the pavement. You can catch this change before it requires serious work by evaluating your garage’s shape on a regular basis. Another natural process that develops, rust, also appears on metal garage doors. Rust even affects components of garage doors made from other materials because springs, bolts and cables can be oxidized. Over time, oxygen and water affect steel or metals that contain steel alloys, so your garage door will likely need rust prevention measures at some point. Coil springs, brackets, hinges, bearing plates and more have a limited lifespan. But replacing a coil spring is a simpler and less expensive process than installing a completely new garage door. A study by the National Association of the Remodeling Industry shows the estimated average cost of furnishing a new garage door is $2,300. Taking care of the minor repairs over the years will help your garage door last for a long time. This small investment will produce big returns. Disrepair can escalate to the point that you must have a professional remove your existing garage door and install a new one. Whether you store tools or your vehicle inside your garage, keep them from sustaining collateral scratches or blows. Scraping your car with the garage door due to poor sensors can be confusing for your insurance claims, too. Whether you are leaving to pick up your children or inclement weather is on the way, you will want your garage door to function smoothly so you can come and go as you please. Gain confidence in your garage door by checking that it is up to standards and will help you arrive on time for your appointments. Do not risk the possibility that the garage door could get stuck, the opener could stop working or the safety sensors could give out. Regular inspection boosts your certainty that your home is a protected and well-maintained area. Working through a maintenance checklist will leave you with satisfaction that each part is in good repair and ready for another year or more of movement. According to a Gallup poll, 39 percent of Americans worry about the burglary of their home when they are not present, and 25 percent worry about the burglary of their home when they are there. It is a common occurrence to be concerned over your home’s safety, but you can take actionable steps to ensure your home is secure. Garage doors, a regular home entry point for many people, are a vital part of protecting your home. Schedule garage door maintenance services for your home to promote a danger-free zone for your family and a fortified home from burglaries. Even residential garage doors weigh several hundred pounds, and if the tension continues to work in the garage door, you will not need to lift the whole weight. The rolling motion makes for an accessible opening, so with supported garage doors, safety is a matter of keeping the parts in order. However, many people have reported injuries due to garage door malfunctions. Past regulations on garage doors were less safe and resulted in many accidents. Now, measures exist like reverse activation and reopening and closing if there was a failure to close fully. The Consumer Product Safety Commission published proposals for residential garage doors to protect users from injury, and garage door manufacturers have made great strides for homes to have a smooth and safeguarded system. However, you need to take extra care of these added features so they can continue to shield you and your loved ones from worrisome incidents. Further protect your family by explaining precautions they can take to avoid injury. Educate your children on the dangers of faulty garage doors. Also, let them know the different signs that signal maintenance is necessary. They can help you evaluate the garage door’s shape and remind you when it is time for the annual checkup. 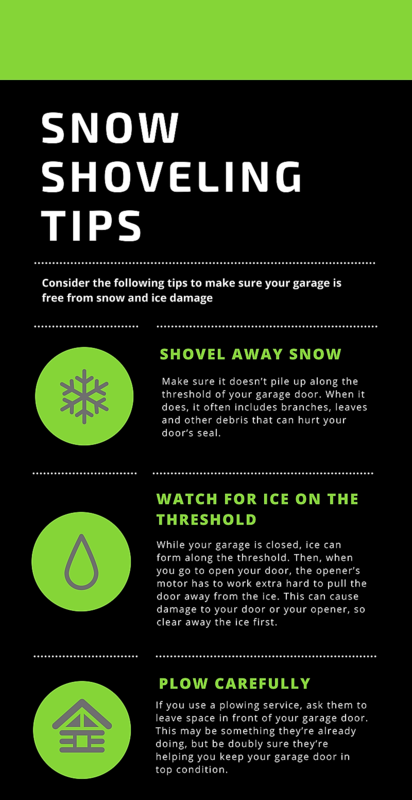 Guard your home against break-ins by following wise garage door practices and keeping your garage door durable. Having a professionaly examine your garage door’s closing mechanisms and loose bolts will seal your home from invasion. These annual checks will establish a rolling line of defense to ward off burglaries. Another way break-ins occur is through theft of the remote or opener. If you misplace the opener, access to the garage door is available to whoever picks it up. Remember to place the garage door opener out of sight, especially in your car, because this is a regular cause of car and home robbery. Be cautious about where you leave or store your opener, and remember that even this remote device needs maintenance. If the remote is damaged, it will need repair like any other aspect of your garage door system. Of the American homeowners with garages and remote openers, 89 percent regularly use their garage door to enter their home. Being locked out of your house because your only entry point is the garage door is another security issue. If your door is not properly lubricated, you could be trapped outside. Make sure you can enter your home without garage door troubles with regular reviews of the fluidity of its opening and closing. Unwanted repairs interfere with your life, complicate your schedule and take up valuable space. But a regular assessment of your garage door gives you an edge over these dilemmas. According to Forbes magazine, 63 percent of Americans do not have emergency funds even for repairs amounting to $500, meaning they resort to scraping the funds together when appliances do break down. Watch out for disrepair and care for your garage door so you can save time, money and hassle. 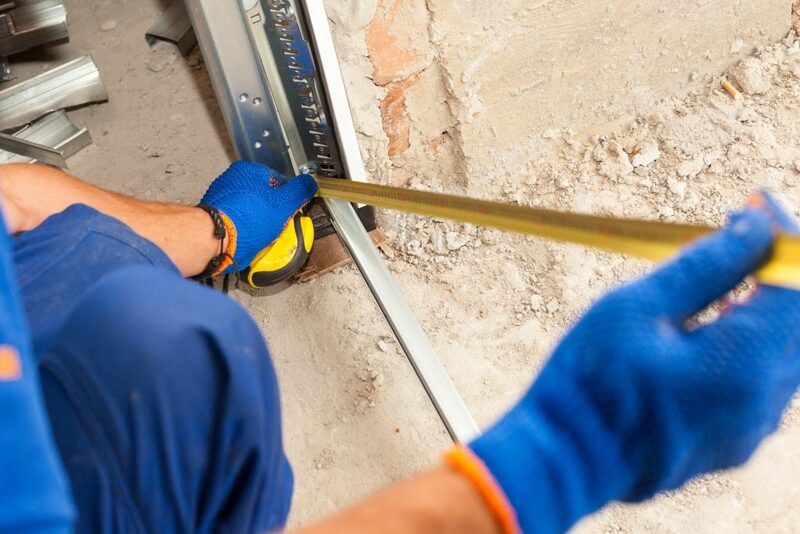 If you wait to perform checkups on your garage door, massive remodeling can come your way — and greatly inconvenience you. You may be unprepared for construction fees when a spring coil fails or your remote opener dies. Ward off large and costly construction projects by recognizing deterioration and minor predicaments before they lead to serious replacements. Factor in checkups now, before unexpected damage puts your day on hold. With routine repairs, your garage door will last longer, and the more consistent you are with maintenance, the more dependable and constant its quality will be. To maximize your initial investment in your garage door, extend its lifespan with annual maintenance visits. Yearly evaluation of your garage door will allow you to manage when the visit happens and the subsequent steps you will take to correct any worn components. When you are scrambling in the morning and you hop in your vehicle to rush to work, you don’t want a slow or jammed garage door to detain you and make you late. Keep problems like this from interfering with your daily routine. Identify problems before they take their toll on your schedule and your wallet. You can schedule adjustments to your garage door during a time that suits you when annual checkups pinpoint problems. Rather than interfering with your home and life, the pristine shape of your garage will add value to your home. If you ever plan on selling your home, the top condition of your garage will reduce remodeling costs and increase the likelihood for potential buyers to make an offer. Conveying how you maintained yearly checkups on the system make it even more attractive. In the United States, the primary use for garages is storage instead of parking a vehicle. In one UCLA study, 75 percent of the middle-class L.A. families in the analysis used their garages for storage to the extent that they couldn’t park their car inside. Whatever you use your garage for, the reality is that you would like to keep it in use, rather than rearranging your possessions to allow for garage door re-installation to happen. When your garage door needs significant repairs due to lax maintenance, you have to move around boxes or give up a parking spot. However, performing upkeep on your garage door spares you the trouble of reorganizing your garage for an extensive overhaul. Return home from work to park your car and be confident your garage door will function smoothly after your annual maintenance visit. The signs you should watch for that determine the state of your garage door can be subtle, but look out for these pieces of evidence of prolonged use. You can perform visual and auditory checks as well as minimal balance tests to judge whether your garage door is in proper shape for optimal safety and convenience. Engage the emergency release or manual release cord to gauge the relative ease of the door’s movement. Look for locations of snags, unevenness and blockage. Sagging may indicate loosened hinges. Contact professionals for garage door lubrication service. Test the reversing mechanism by placing an obstruction below the garage door. For automatic garage door maintenance, make sure the garage door does not close on the item, but rises before it hits. Visually inspect for loose bolts and other unsteady parts on the garage door. Do not tweak the components yourself, but immediately contact a professional to repair any detached or loosened places. Check for your remote opener for a proper signal and response. Perform routine garage door opener maintenance. Evaluate the regular wear and tear on the door. Look for scratches, dents or more seriously compromising defects. Assess the door’s balance by lifting it in increments to see if it closes or stays perched at the height you left it. Test this from a fully open position, too. Be wary of torsion springs and do not attempt to repair them yourself. The extremely taut nature of a single torsion spring is too dangerous for an inexperienced person to fix. Look to see if the tracks and rollers are clean or need to be wiped down. You can do this maintenance job at home, but contact a professional for further inspection. A garage door has a substantial amount of components to keep up with, including cables, drums, a torsion shaft, tracks, rollers and coil springs. Get professional services to most accurately test the condition of the door and safety systems. Garage door servicing experts will be able to give you specific feedback and instructions for preserving the door. Ensure your garage door is functional and safe by organizing an appointment for garage door maintenance services. An annual checkup will allow you to continuously gain peace of mind and have confidence in your home’s security, your family’s safety and your garage door’s stability. Stapley Action Garage Door has been providing garage door maintenance for over 30 years. For garage doors in Mesa, AZ, and the surrounding area, we are ready to service your residential or commercial garage doors. Our technicians provide exceptional and friendly service and strive to meet your garage door maintenance needs. Contact Stapley Action Garage Door to keep your garage door in top shape. As a homeowner, you’ve probably never researched the parts of your garage door, but you’ve most likely heard of a garage door’s torsion or extension springs. These are two different types of springs that are responsible for managing your garage door’s counterbalance system. The counterbalance system uses force to offset the weight of the door, allowing it to safely and reliably raise and lower. To manage the counterweight, the system uses either a torsion or extension spring. So if both springs perform the same function, what’s the difference? While there are several different types of springs that can be used in your garage door’s counterbalance system, the two most popular options professionals use are torsion and extension springs. Sturdier and longer lasting: While torsion springs are more expensive than extension springs, they are more durable and last 15,000 to 20,000 cycles. Less wear: When raising and lowering your door, torsion springs offer a steadier movement that keeps the door better balanced and creates less stress on parts. With torsion springs, your garage door opener doesn’t have to work as hard to open and close the door. Safer: If your garage door spring ever breaks, the torsion spring will create a loud sound but remain inside its shaft, while extension springs can snap off and cause property damage as well as injury. Extension springs are older technology, but they are still a common option for many garage doors because they are less expensive than torsion springs and are an ideal solution for small garages. They don’t occupy much overhead space because they are installed on the side of the door versus overhead and extend whenever the door is operating. While a popular spring option, extension springs are less recommended by professionals because they only last 10,000 cycles, require more maintenance than torsion springs, operate with a jerking motion that results in additional wear and tear and can be a safety hazard when broken — they can snap away causing personal injury or damages. However, despite these drawbacks, extension springs are generally safe when the safety cables are installed, and they are properly maintained. TRUST STAPLEY ACTION GARAGE DOOR FOR GARAGE DOOR SERVICES IN MESA AZ! Whether your garage door utilizes torsion or extension springs, the experts at Stapley Action Garage Door are available to maintain your system or perform safe, fast and effective replacements. If you’re unsure of what type of spring system your garage uses, feel free to consult the expertise of our trained technicians — we are happy to answer any questions you may have and make recommendations about which option works best for your daily needs and budget. If you’re looking for torsion spring replacement in the Phoenix area, call the professionals at Stapley Action Garage Door with your garage door installation and maintenance needs. Since 1986, we’ve been the most trusted garage door sales and repair company in Arizona and throughout the Mesa and Flagstaff communities. We also offer a large selection of high-quality and attractive Clopay® garage doors. Contact us today by filling out our online form or calling 480-655-1255 to speak to one of our specialists. With the arrival of spring, you might’ve opened your garage to realize that this space has become a haven for overflow and unorganized storage — old boxes and toys, seasonal decor, home improvement tools, vehicle fluids, lawn and garden equipment and more. While cleaning and organizing may seem impossible, you can easily reclaim the space in only a day or weekend. Start by establishing a clear objective or vision to reorganize your garage to fit your daily needs. For example, do you simply want more organized storage for tools and decor, or do want to repurpose the space into a workshop or hobby area? Once you have your objective, start by sorting through all of the items currently stored in your garage and place them into three categories — keep, donate and toss. Get rid of any toys your children have outgrown or no longer use as well as broken items, expired chemicals and anything you haven’t used in the past two years. Now that you’ve decluttered, you can begin simple cleaning and garage organization. Once you’ve organized your garage clutter, you can clean the space to keep it attractive and safe — sweep up debris, hose the floor and scrub with a gentle cleanser. If you need to remove any grease, oil, paint or rust stains, use a natural or heartier cleaning chemical. To begin organizing your garage, measure the dimensions of the room — including the size and location of windows, doors and light switches — to help determine the type and size of storage best suited for the space. Also, record the area your car requires. For effective and proper organization, keep frequently used items, such as bicycles and trash or recycling bins, easily accessible. Also, categorize similar items like yard tools, seasonal decor or sporting equipment, so they stay together. After you’ve categorized the items you kept, determine where each category should be stored. Consider how often you use each item and the storage space available. Use built-in cabinets and clear, modular storage versus cabinets with doors. With open shelving and clear bins, you can quickly scan the items stored in each space and be discouraged from hiding clutter behind shut doors. For organizing tools, sports equipment and gardening tools, consider vertical storage like a wall-mounted pegboard or wire grid. To utilize wasted ceiling space, install overhead garage shelves that are mounted to the ceiling for seldom-used items like camping gear and outdoor or holiday decorations. Keep any items or storage units off of the floor to free up foot room and car space and avoid unsightly, disorganized piles. After cleaning and organizing your garage, create a schedule to maintain your organization efforts and remember to promptly put away items after they’ve been used. For over 30 years, Stapley Action Garage Door has been assisting home and business owners of Phoenix and the surrounding communities with all of their garage door design, repair and maintenance needs. We provide the finest and largest selection of Clopay® residential and commercial garage doors in the area, and we invite you to visit our storeroom to view our entire catalog. Schedule garage door services today by calling us at 480-655-1255 or completing our online contact form. You can also fill out our online estimate form to receive a free project quote. A garage is a valuable space for storing some of your most important assets. 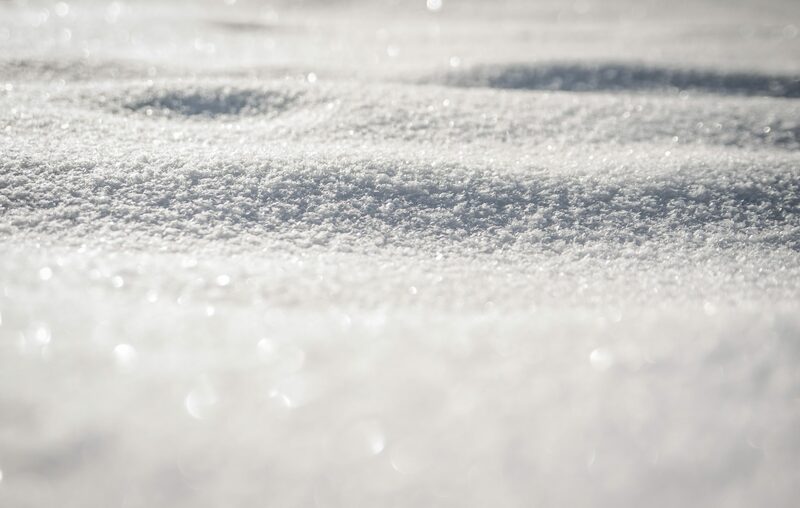 When you live in an area that experiences harsh winters, you’ll want to ensure your garage stays as warm as possible. When you keep your garage warm, you’re able to extend the lifespan of your belongings — everything from cars to bikes and toys for the kids. Add weather-stripping: When was the last time you looked at your garage door’s weather-stripping? Weather-stripping is often the first thing to start deteriorating — especially when you live in a climate with direct sun and hot summers or when you live somewhere that experiences cold winters and lots of snow and ice. These natural elements can wear away weather-stripping over time, which of course leads to a garage that won’t stay as warm during wintertime. Insulate walls: You should treat your garage just like you treat the rest of your house: by insulating walls to ensure the space stays as climate-controlled as possible during the coldest months of the year. Also, don’t forget about other spaces where warm air can escape and cold air can sneak in. That includes your electrical outlets, which are easy to insulate. All you need is a few minutes and a small investment in materials. Invest in a heater: One of the best things you can do in addition to insulation and weather-stripping is to add a heater to your garage. 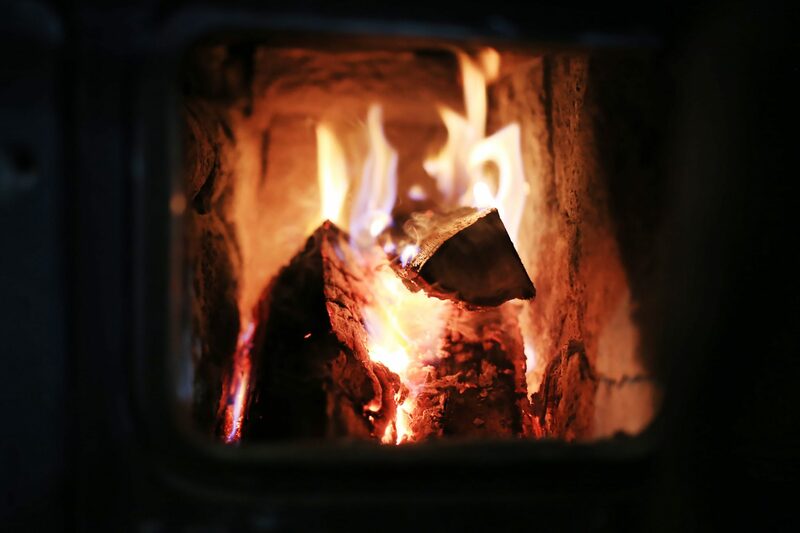 You can find small space heaters that deliver just enough warmth to keep your belongings in great shape throughout the coldest months of the year. A space heater can also help reduce your heating costs throughout the house, and your heater won’t have to work as hard to replace hot air that escapes into the garage. Choose an insulated garage door: Perhaps the best thing you can do for your garage and its warmth throughout winter is to choose an insulated garage door. An insulated garage door is a valuable threshold against the cold outdoors when the days grow short and the weather gets frigid. Where can you find an insulated garage door for your Arizona home? At Stapley Action Garage Door, our garage door technicians help homeowners with garage door insulation that keeps their garages warm throughout the coldest months. Insulated garage doors are also more substantial, which can lead to greater durability. You’ll also find that they operate more quietly and deliver insulating benefits during the hottest months, too. We are proud to serve homeowners throughout the Grand Canyon state. When you’re interested in insulating your garage for winter, contact us today or call us at 480-655-1255 for a huge selection of high-quality insulated garage door options. If you live in a place that experiences extreme weather of any kind, you need a garage door that can stand up to that extreme weather. Here in Arizona, we experience serious wind and dust storms that can pose threats to structures of many kinds — garage doors included. The same holds for areas that may experience tropical storms, hurricanes or even tornadoes. What a homeowner should do in these cases is take steps to properly stormproof the garage door. Wondering how to stormproof a garage door? It’s not as complicated as it might sound when you investigate your options and make an investment in the right products or accessories. All you need to do is weigh your options and make the best decision for your home, your garage and your unique needs. 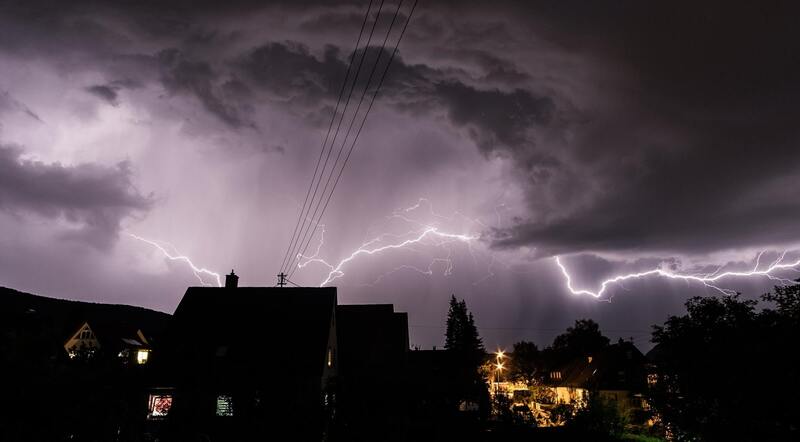 Here’s all the information you’ll need to ensure you’ve done everything possible in securing a garage door for storms. Why is it so important to hurricane-proof your garage door? Let’s start with this: A garage door is the entry point for the largest opening in your home. Because of how large of a space a garage door protects, it needs to remain strong in the face of a storm. If a garage door fails during a hurricane or another type of powerful storm, the air pressure under your roof can change — which can lead to the roof failing as well as other structural damage. Then there’s also the cost of replacing a garage door. Even if a garage door’s failure doesn’t lead to structural damage or roof failure, you’ll still need to go through the costly process of replacing your old garage door and hauling it away. It’s always better to get a durable garage door that can withstand hurricane-strength winds in the first place. If you’re in the market for a new garage door, you can choose a hurricane-proof model that is strong enough to withstand almost any type of extreme weather. Hurricane-proof garage doors often feature twist-resistant components like framing, as well as track systems made of super-durable steel. You can also choose an impact-resistant garage door that’s going to give you similar features and benefits, including steel or fiberglass construction and designs that are meant to prevent damage from objects that come into contact with the garage door. Don’t forget the windows, either. You’ll want hurricane-proof garage door windows that can also survive extreme weather events. Also, many cities and other local or regional governments have codes in place that dictate minimum standards for wind resistance in home construction — including garage doors. You can also choose a wind brace for garage doors if you’re not in the market for a completely new door. A wind brace kit helps you retrofit your garage door for greater strength in the midst of a wind storm or hurricane. Wondering how a wind brace works? It simply provides additional structure and hardware that promotes the integrity of the existing garage door in case of high winds. A garage door wind brace costs about a third or half of what a new garage door might cost, so be sure to weigh the benefit carefully before making a decision. Only you can answer the question or what’s best for you and your home. If you have a fairly new garage door that you would like to strengthen and keep in good shape as long as possible, a wind brace kit might be the best option. If you have an aging garage door that needs replacing anyway, you may consider a storm-resistant option that eliminates the need for a bracing kit. At Stapley Action Garage Door, we work with homeowners in Mesa and throughout the Phoenix area who need guidance when making important decisions about their garage doors and about their homes. Are you considering a hurricane-proof garage door? Are you trying to decide between a new garage door and the additional strength of a bracing kit? We would be glad to talk through your options or even to visit your home and provide an expert recommendation. When you choose Stapley Action Garage Door, you can rest assured you’re getting service from the best of the best in Mesa, Flagstaff and other surrounding areas. Our experienced and knowledgeable garage technicians work quickly and effectively to meet your needs and ensure you have the high-functioning garage door your home requires to operate at its peak potential. For garage door installation, repair or maintenance, or for other services like wind bracing, trust the expert team you’ll find at Stapley Action Garage Door. Contact us today or call us at 480-655-1255 about hurricane-proof garage doors or wind bracing kits. As homeowners, we all have this lingering desire to take care of repairs and maintenance on our own — to become masters of the DIY lifestyle. And that’s wonderful in cases where the repairs or maintenance are easy and safe to accomplish. But it’s not quite as good of an idea when attempting DIY repairs can pose a serious threat to the homeowner’s safety. This certainly holds true when it comes to repairs for a garage door. The dangers of DIY garage door repair are numerous and should be taken seriously before you engage in a project. Here’s a look at the reasons behind the dangers of repairing a garage door. There’s no replacement for knowledge and experience when it comes to repairing a garage door. One of the most common things to happen when a homeowner conducts DIY repairs is that they end up making a problem worse. Of course, when you make a garage door repair issue worse, it costs you time and money. When you choose an experienced and knowledgeable garage door repair technician, however, he or she can quickly diagnose the issue, make recommendations and then execute on the chosen repair or replacement. 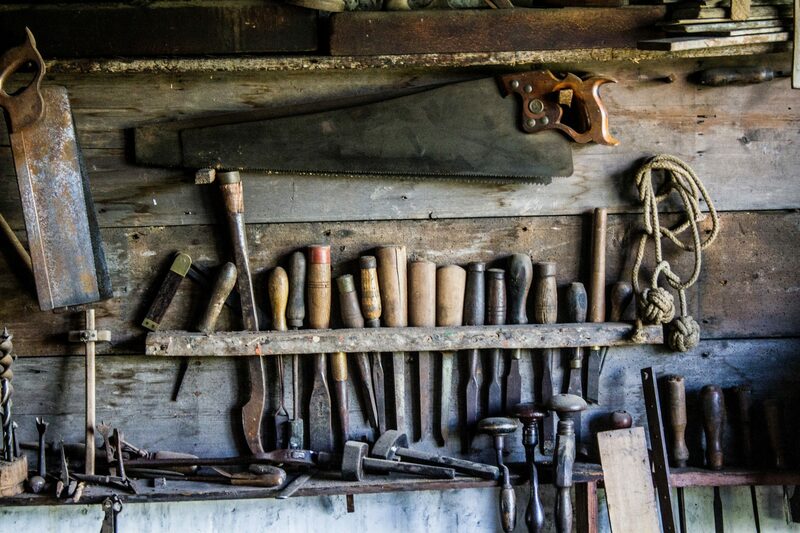 Checking your garage door and making needed repairs requires a unique set of tools that aren’t typically present in the home. Why? 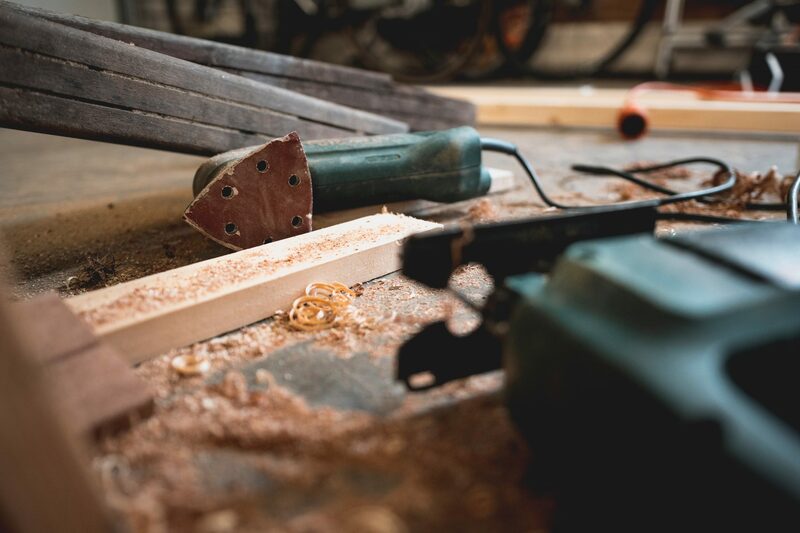 Because most homeowners wouldn’t have a use for garage door-specific tools most of the time, and buying those tools wouldn’t be worth the investment. When you choose professional garage door repair and maintenance, technicians should arrive with the proper tools ready to go. Professionals have the tools, and they also know how to use them. Falls: Not only do garage door repairs ask you to work on a stool, ladder or another elevated surface, but the nearness of the ceiling can put you in situations that make falls more likely. When you fall, you could injure yourself or someone else, and you may also damage equipment that’s either nearby or being used at the time of the fall. Springs: This is the greatest danger homeowners face when working on their own garage doors. Torsion springs are under an immense amount of tension and pressure. It’s the tension and pressure that make your garage door raise and lower with ease — but they may also turn garage door repairs dangerous if you don’t know what you’re doing. Professionals know how to handle torsion springs and how to prevent them from becoming projectiles that could cause serious damage and danger. Collapses: Garage doors weigh hundreds of pounds. And, when you’re inexperienced and trying to perform DIY repair, the likelihood of a garage door and its hundreds of pounds collapsing on you shoots through the roof. As noted, so many things can go wrong with a garage door, and many of those things can get worse — or become dangerous — when an inexperienced homeowner tries out DIY repairs. So, rather than making things worse and putting yourself in harm’s way, lean on a professional’s experience and knowledge. You can find plenty of instructions on how to correctly lubricate a garage door and its many pieces. While it’s not a good idea to execute DIY repairs, many DIY maintenance tasks are tasks you should put on your calendar and do on a regular basis. At Stapley Action Garage Door, we are your source for expert garage door installation, repair and maintenance in Mesa, Flagstaff and the Greater Phoenix area. We offer a team of experienced and highly knowledgeable garage door technicians who work quickly and effectively while also respecting your time and property. We understand that garage door issues are urgent and demand a fast response. That’s why we react quickly to all calls for garage door repair in Mesa, Flagstaff and communities surrounding Phoenix. Trust your home and its garage door to the best service providers possible when you call on Stapley Action Garage Door. Contact us today or call us at 480-655-1255 about garage door repairs in Mesa AZ. There are very few home features that have as big an impact as your garage door. You might be in a subdivision neighborhood where row after row of garage doors feature prominently on façades. Or, your home may sit on a larger lot where your garage is set back and more subtle. No matter where you live, your garage door makes a statement. Curb appeal says a lot about your home’s value. 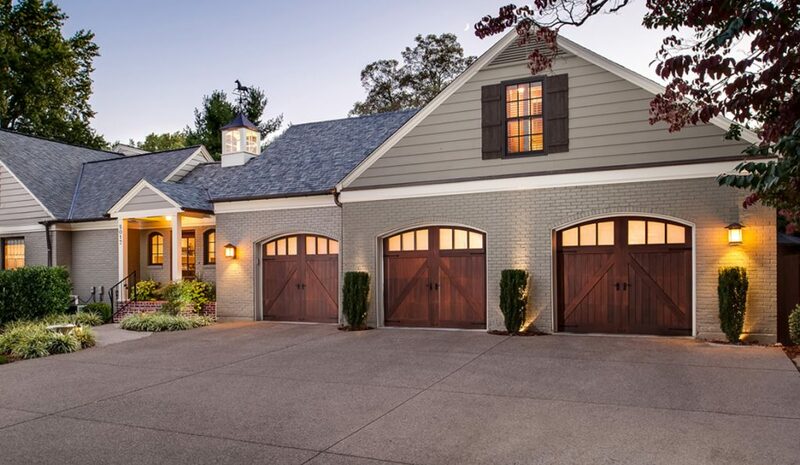 The importance of garage doors for resale value can’t be overstated. A new garage door is one of the top ways to improve curb appeal. Changing your tired and dull old garage door for a chic new look adds value to your home. A new garage door will also make help you sell your home quicker. A faster sale translates to value. If you were to ask any realtor what home improvements add the most value, invariably they’ll say your garage door. But don’t just take a real estate agent’s word for it. Stand back and look at your home from the street. Does your garage door send the “buy me” message? If not, you should replace it. But why does your garage door play such an important role in the look of your house and your ability to sell it? It’s because of the amount of visual space your garage door occupies. Think about the ratio of garage door area compared to that other vital architectural component—your front entry door. A typical front entry unit is 36” by 80”. That’s 20 square feet. A standard double-sized garage door is 192” by 84” or 112 square feet. Your garage door is five and a half times larger than your entryway. Compound that massive visual space with proximity to the street, and it creates an even greater impression. That’s why you’ll hear home designers, builders and realtors speak about how vital “garage door architecture” is. So many home designs have their garage door as the largest architectural detail, usually for practical reasons. Large, up-front garage doors enable easy access for vehicles of any size. Setting garages back from the façade takes more space and increases construction costs. That’s why when you drive through America’s newer neighborhoods you’ll be greeted by large garage doors. And all of them give a first impression – some better than others. Does a Garage Door Increase Home Value? When you ask a realtor if a new garage door increases home value, you’ll get a resounding “yes.” They’re not just saying that as part of a sales pitch. They can back it up with multiple studies done on how much value a new garage door adds to your home. Every single study reports the same thing. Replacing an old garage door with a fresh, modern looking model provides one of the highest returns on home remodeling investments you can get. The Cost and Value Report is a trusted and credible publication. They’re now in their 28th year. In studies done in collaboration with the National Association of Realtors, the Cost and Value Report consistently states that replacing your garage door is the single best home improvement project you can undertake. That’s for both upscale and mid-range projects. These studies look at national averages where return on investment value is rated. These figures vary depending on the reporting area, but every one consistently supports the idea that garage door replacement increases home value. They also report shorter selling times for homes with new garage doors. Expected investment returns vary by city and region. Returns from the Pacific Northwest, Middle Atlantic and California regions reported return ranges from as low as 78 percent on investment to as high as 146 percent. That works out to an average of 115.6 percent or $1,156.00 back on a $1,000.00 investment. Nowhere else can you get that big return on your remodeling money than a new garage door. That includes spending on big-ticket items like kitchen, bath and flooring upgrades. There’s no doubt a new garage door gets you the best bang for your buck. It costs far less than most other home improvements and has the highest return value. That includes increasing that all-important curb appeal, which makes for a quicker sale. How could you go wrong with that? Modern garage doors are far superior to what was available even ten years ago. Back then, most garage door designs were the plain and simple sectional overhead models. Many were flat steel, but you could upgrade to raised-panels with wood grain embossing. Most were white with painted enamel finishes baked-on for durability. There were limited options for older garage doors. Upper windows were a favorite upgrade. Some windows even displayed mullions like traditional grids or the now-dated sunbursts. But most older garage doors were designed for a practical job. Little thought was given to architectural aesthetics. Garage doors built in the past 20 years also used a limited range of materials. Light-gauge steel was the most popular material because of its light weight and relatively high durability. Manufacturers tried aluminum as well, but the material simply couldn’t stand up to the rigors of daily ups and downs. Medium density fiberboard (MDF) was another option. MDF took nicely to paint, but these garage doors were excessively heavy. They also didn’t do well in wet conditions. Today, the range of designs, materials and options available in garage doors is extensive. In fact, choices can be almost overwhelming for the average homeowner. Current garage door designs are sometimes so aesthetic and sophisticated that it’s hard to tell if you’re looking at a garage door or a carefully crafted architectural wall feature. Garage doors that are selected to complement your home’s original architecture can be stunning. You can make an enormous difference to a home’s curb appeal by changing just one feature – the garage door. In less than one day you can go from being another Plain-Jane on the block to a head-turner. That’s what the right garage door can do. Now you have a range of garage door designs to choose from that may not have been dreamed up yet when your home was built. You can choose from traditional designs with tried and proven raised panels. Today, you can also customize the color of your garage door to match your home. You can upgrade to old-fashioned carriage house designs that appear to swing from side to side but, in reality, roll up. Or, you can stick with classic designs. The clean lines of a modern garage door might be all that’s necessary to create a crisp, horizontal effect while remaining understated. You can turn to real wood for a rustic or country look. Many lightweight and durable materials are available in today’s designs. Nowadays, painting and staining are easy as well as long-lasting. 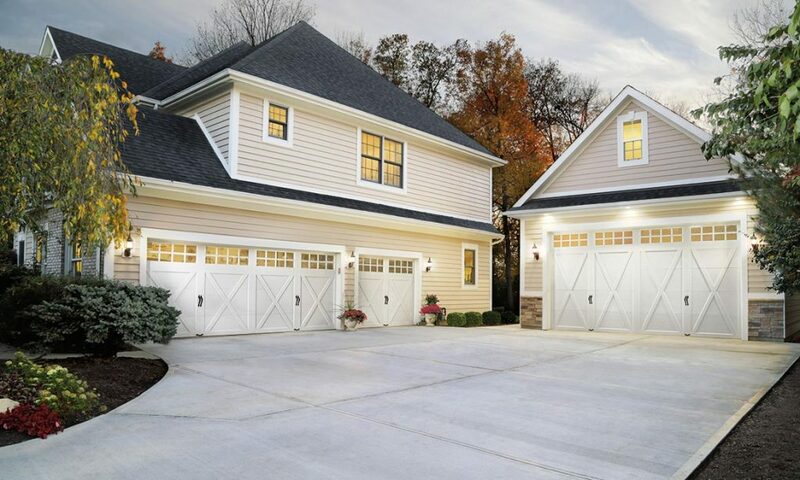 There’s an endless array of garage door designs on today’s market. You can work with your garage door supplier to have any style or combination of options installed on your new garage door. But occasionally, that perfect design isn’t quite there. In that case, you can have a garage door custom-made to fit your taste. Customization doesn’t just mean a unique design that doesn’t exist elsewhere. You can take a stock design that you like and have it custom suited to a particular size. You can also choose your own colors and textures. You can even customize accessories like hardware, fittings and exterior accents. Custom windows are also an option for your new garage door. Windows play an important part in architectural appeal. They add that perfect touch that compliments your garage door and matches your other windows to give your façade a uniform appearance that gives your home its own unique look. Garage door windows do more than add curb appeal. They play a crucial role in safety, security and energy-efficiency. Windows let light into your garage, so you can safely move about during the day. Appropriately placed and treated garage door windows provide security from prying eyes. And garage door windows designed not let heat escape help conserve energy in colder climates. Energy-efficiency is important to many homeowners. 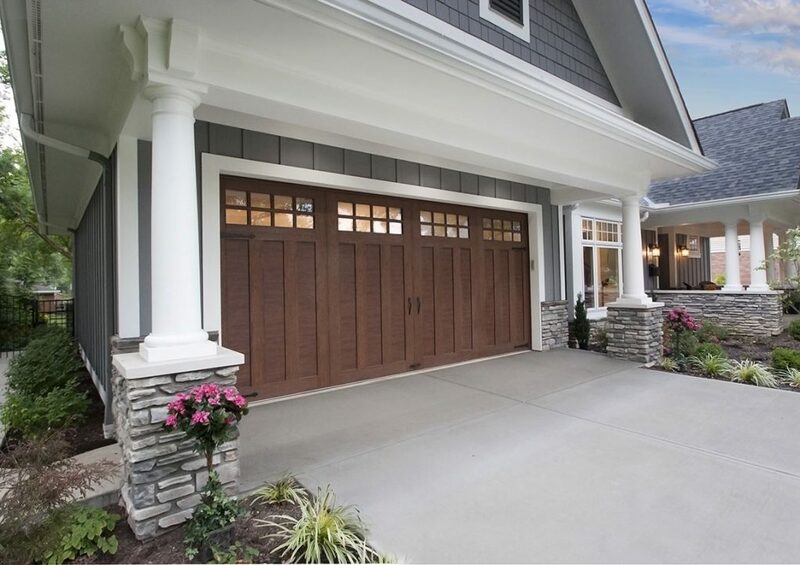 Although your biggest return on investing in a new garage door comes from the impressive curb appeal you’ll get, don’t overlook another value found in the right garage door – energy-efficiency. Once you’ve piqued prospective buyers interest with your house’s looks, they’re sure to check if your new garage door is energy efficient. Older insulated garage doors were poor performers. Usually, they had bare Styrofoam glued onto the inside metal panels. This did little more than prevent condensation. It didn’t offer much in the way of preventing heat loss and preventing air leakage. By choosing an energy efficient new garage door, you’re adding one more positive aspect to your home that prospective buyers will take note of. Today’s top-quality energy efficient garage doors do what they’re advertised to do. They have exceptional R-value, a measurement of their ability to restrict heat flow, and are designed to control air leaks on all sides. Highly efficient garage doors are well worth the minimal extra expense. Clopay is one of America’s leading garage door manufacturers. When you hear the name Clopay, you know the brand represents the finest materials and craftsmanship available in today’s garage doors. Your prospective buyers will recognize the Clopay brand. Even if they don’t see the Clopay name from the street, they’ll know it from the design and attention to detail that goes into every Clopay garage door. Brand recognition does more than reassure you that you’ve installed a quality product that looks exceptional. It subtly suggests you’ve paid attention to every aspect of your home. That starts with choosing from Clopay’s extensive selection of designs. Here are the leading collections of high-quality new garage doors that Clopay offers. The Avante Collection transforms your home’s appearance with a modern look. The horizontal Avante lines use aluminum and glass features that allow natural light through the day to filter through your garage and return to a warm glow at night. The Avante collection also has useful privacy features and a stylish look. You can also customize colors with Avante garage doors. With the right color, right windows and the right amount of aluminum accents, you’ll be sure to improve your home’s curb appeal immensely. Canyon Ridge is another Clopay collection that adds beauty to your home with its insulated carriage house doors and faux wood overlays. They’re unique, beautiful and constructed with energy-efficient Intellicore© insulated steel bases. You get the appearance of traditional swing-out carriage house doors with this collection. The doors look fantastic from the street but have every convenience of modern, roll-up operation. A wide choice of composite exterior finishes is available. The Classic Collection offers traditional raised-panel appearances in a wide range of design and construction options. They give you the classic look of time-tested door looks made with the best materials. Classic garage doors are made of durable steel and come in insulated and non-insulated models. Classic garage doors are ideal for areas with strong winds. They’re made with Windcode® reinforcement that meets building codes in hurricane and tornado zones. Possibly the Clopay Coachman Collection is another perfect option for increasing curb appeal. Coachman doors also feature a carriage house design but are constructed of high-quality steel instead of wood or composites. These garage doors are low-maintenance and long-lasting. 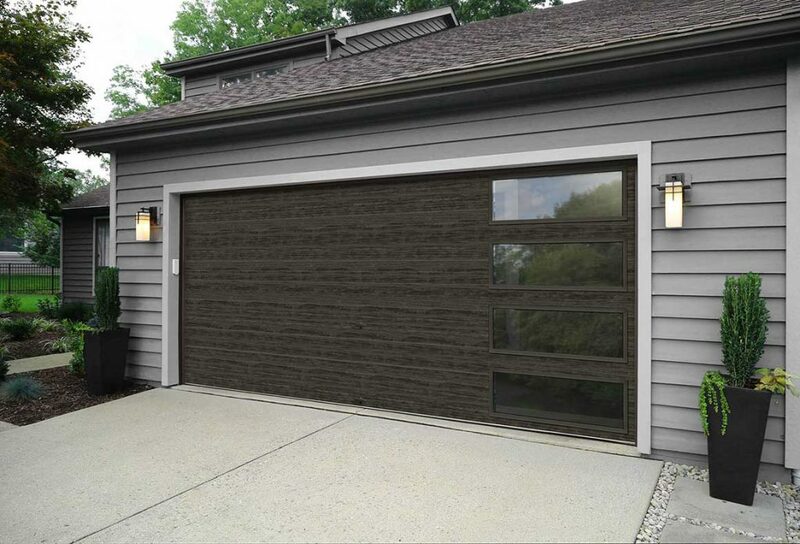 Coachman garage doors have the same charming appeal as the Canyon Ridge collection. They also have a swing out appearance but roll-up convenience. You can also get them with energy-efficient insulation..
For a truly custom application, the Reserve Wood Collection is for you. Clopay can work from a professional architectural drawing or even a sketch to produce the garage doors you can only imagine. Choose from exotic woods like Spanish Cedar, Ironwood, African Mahogany, White Oak or Knotty Alder. Or, you can step up to Clopay’s Reserve Wood Limited Edition Series for designs that are exceptionally beautiful with high energy efficiency and strength. Clopay brand garage doors are your best return on investment for adding value to your home. Clopay garage doors give you stunning curb appeal for a reasonable price. But choosing Clopay as your new garage door brand isn’t enough. You need to make sure your Clopay supplier also installs your new garage door. Stapley Action Garage Door has been serving the Phoenix Metropolitan area since 1986. Over the years, we’ve installed thousands of new garage doors in homes and businesses. We’re proud to supply and install all of Clopay’s excellent products and to help your home stand out. At Stapley Action Garage Door, we’re only as good as our people. We’ve assembled a first-class team of installers, sales and service people. Our experienced technicians provide trouble-free installation and quickly transform your façade from plain to outstanding. Contact Stapley Action Garage Door today or call us at 480-655-1255 if you are looking for garage services in Mesa, Flagstaff and surrounding areas. We look forward to helping you take your home’s curb appeal to the next level.